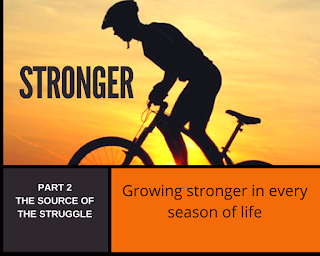 STRONGER | THE SOURCE OF THE STRUGGLE. PART2. For Part1please click here. I came across a book early this year by Havilah Cunnington titled “Stronger than the Struggle”. I strongly recommend you read it. Much of what I am blogging here is from that book. The blogs in this series are reflections and a summary of what I got from this fantastic book that I recommend you to buy. In the last Blog, we reflected upon the fact that everyone goes through struggles and that does not disqualify you from being used powerfully by God. He will use the very thing that has tried trip you up to be a trophy of His enduring Grace in your life. We fight from a place of victory because of the finished work of the Cross. In our struggle, we need to be utterly convinced that God is for us, and His intentions toward us are always good. We need to surrender and yield to His sovereign will, timing and ways. We also need to remind ourselves at the end of the day our struggle is not against flesh and blood (though satan uses flesh and blood living people to cause strife. Our fight is against spiritual forces at work. Once we recognize this we will learn to engage the right enemy and not our spouse, child, friend, mother in law, work colleague etc. I think the battle largely starts in the mind, our will, and our emotions i.e thoughts, decisions, feelings. Our battles can come from inside our own minds. We belong to Christ once we accept Him. However, our minds need renewing. We do not fight our old self or the flesh because that already died with Christ on the Cross. We are told that the old has gone (2 Cor 5:17) and the new has come. So don’t waste time beating up a corpse! Point out the two untruths in these verses. God did not say “any” tree but only one tree. Then Eve adds her own spice “you must not touch it” did God say that? Did the devil forget what God said? Was he really asking Eve for clarity? NO!! He was engaging her mind. Have you heard this saying, “Curiosity killed the cat!” Curiosity, in this case, created confusion that indeed led to death. The devil will do everything you make you distrust God. So it is important for you to know the Word of God and apply it appropriately. Trust believes God’s intentions towards us are good. You need to partner with the truth and not the lies the enemy is feeding you. What you partner with you empower. Partner with truth and empower the truth. Partner with a lie and you give it a place of influence in your life. Therefore, he will try to destabilize your mind – fill it with doubt and unbelief. Remember God wanted to live and have close commune with his creation forever. Sin marred that plan. Sin and God could not co-exist. Good and evil could not be in heaven. Therefore, God’s salvation plan come into play and he sends Jesus to redeem us. We are now his children because of accepting this gift of salvation. I am a child of God. However, the battle still rages. The war over Satan has been won. But he is like a chained dog still thrashing about harming whatever in within his reach. We can have thought patterns that are sinful and do not reflect the heart of God. We need to retrain these our minds. The Bible calls it the renewing or transforming our minds. When we do this we will be able to discern God's will for our lives. Rom 12:1-2. We have been used to thinking and reacting in certain ways viz. getting angry, being impatient, rude, taking offense, being selfish etc. Now we have to replace those reflexes with new ones. When we do this, our behavior will change. When our resolve in our mind weakens, it affects the choices we make. We act on what our minds meditate upon. Therefore, it is very important what we think. What we think about affects how we feel. When you indulge in negative thoughts, you feel down, and it shows in your actions, tone, face. When you are praising God, having a thankful heart it changes your mood and how you feel. As Christians, we have a new identity in Christ. We are children of God loved completely and have the same access to all God's goodness. However, sometimes it feels like others get more than we do. Doesn’t it? That they are more favored by God and we are left out. That is a lie. God has more than enough for all of us. You will not go without. This comes from a poverty mindset that thinks God is holding out on us and does not want to give us the best in our lives. This is when we need to renew our minds and remind ourselves of God’s good intentions toward us. What we are thinking will change our behavior and our feelings. Sometimes our battles are simply because we live in a fallen world. The Bible reminds us that it rains on the righteous and unrighteous. There is sickness, sin, sorrow, wickedness all because sin entered the world. Sometimes we are victims of other people’s poor choices. These have a domino effect on our lives. E.g.) A person driving a car breaks the signal and injures someone crossing the road. The choice to break the law on the part of the driver had a ripple effect on an innocent pedestrian. God has given everyone a free will. True love requires that we have a choice. Eve made a bad choice, a selfish choice. She fed her curiosity and desire. The result has had a ripple effect on history. This continues for those who have not put their faith in Jesus. For those who have, Jesus death arrested that curse and canceled it. We can face the battle, the struggle if we have the right core values and belief system. How we make choices and take decisions affects things and people around us. What do we think about God, ourselves, our life, people? All this affects the way we behave. What is shaping your core values? A lot of the times this needs to be recalibrated. The standard against which this is done is the eternal, unchanging truth that we find in the Bible. We need to realign our thinking to that standard or plumbline. FREEZE – Here you feel powerless. This can happen because we feel overwhelmed, anxious, fearful, incompetent or confused. We can be like that deer with headlights in the face and just freeze rather than respond. We could even play dead like the possum and hope for the conflict or battle to blow over. Here we take on everything as a challenge. Like a lion, we will roar and fight back and not back down. In the spiritual realm, we can see demons everywhere, in everything and on everyone. We can overreact. We can respond in fear and get defensive about everything or we can stay open-minded and learn what the situation has to offer. When we are defensive, we get into tunnel vision. We are unable to think clearly or see things from just one angle. Our prejudices about that situation or a person color everything we see and experience with that person which only further builds up the animosity or the distance. When we are like this our mind shuts out all other options and ways of thinking or approaching a problem. We need to ask the Holy Spirit to give us discernment to understand the nature of the problem and its source. Do not over analyze things. Just remind yourself that that power that raised Jesus from the dead is alive and at work in you. You are powerful. In Eph 5 God has given us a whole battle suit. There is a lot there for our protection. We have one piece of weaponry that is for the offense. Everything else in the armor is for our defense save one i.e the Sword of the Spirit which the Word of God. We need to know how to use it in order to fight well. Don’t give into fear. Fight. As Kris Vallotton says “Fear is faith in the wrong kingdom”. So reflect upon which one of these three is your response? Once you recognize it you will be able to respond in a way that helps you face and fight the enemy and see victory. Understand where the battle is coming from - is it internal - Do our thought patterns need adjusting? Are our emotions a runaway train? Is the source of our battle external? Pray into that situation and remember your battle is not against flesh and blood even though it might look like it.